We also supply elegant window box wall brackets that complement this window box sold separately. These are supplied with screws and rawplugs. See image below. 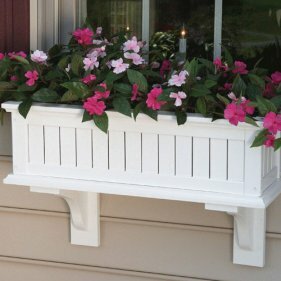 The Kensington Wooden Window Box is perfect for any window ledge, wall or fence. The design is elegant and was inspired by the Kensington planter. It is a beautiful way to display your plants and flowers whilst looking good in its own right. 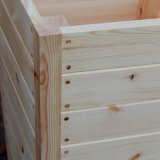 Kensington windowboxes are made from Scandinavian red pine with holes in the base for good drainage. The windowboxes can be finished in clear, golden brown, wild sage or white preservative. We also offer a selection of Farrow & Ball paint finishes. because they get frost from all directions - top, bottom and sideways. The best compost for bulbs is John Innes No.1. with an added handful each of multipurpose compost and grit. Plant bulbs no more than 2,5 cm apart or even touching; any gaps will look unsightly in a window box display. Plant the daffodils at the same time as the crocus in another planter, or in several if that is more convenient. It doesn't matter if these planters look a little shabby, because the flowers will be moved into your window box later. You can plant the tulip bulbs as late as November, again in spare planters. Put all the planters in a sheltered place to grow, ready to be brought forward one at a time. Deadhead after flowering, then lift the plants to make room for the next ones. The old bulbs can be moved into your borders, or into other planters to die off and be stored until next year.